NoctuRest Reviews - Is it a Scam or Legit? Taking between one and three doses per day, the manufacturer advertises that NoctuRest can help address your insomnia and anxiety symptoms, without harmful ingredients. NoctuRest is a daily, raspberry flavored liquid nutritional supplement that utilizes a blend of potent, science-backed ingredients to help you find relief from restlessness, achieve healthy sleep patterns, and wake up feeling refreshed. The website advertises that you’ll need to apply one full dropper (about ¼ teaspoon) underneath your tongue approximately 20-30 minutes before bedtime. With regular use, you could experience noticeable improvements within a week or two, and gradual improvements thereafter. And all of this without using habit-forming ingredients or other harmful medications. But, you’re likely already familiar with NoctuRest’s marketing claims. Instead, you want to know if it works in the real world. We’ll start from the basics and work our way up from there to help you find some answers. Mental – Depression, anxiety, etc. If the cause of your insomnia is secondary, your doctor will likely recommend you start by addressing the underlying cause (e.g., avoiding tobacco/alcohol, changing your work schedule, etc.). Either way, additional treatment options include cognitive-behavioral therapy and prescription medications. What about natural dietary supplements like NoctuRest? Can this formula provide a similar level of relief from sleeplessness? We’re not medical or clinical professionals, so when addressing whether or not an ingredient is ‘effective’ for a specific claim, we rely on summarizations of the available clinical evidence provided by sites like the Natural Medicines Database, WebMD, and Examine.com. And according to these sites, there is some controversial evidence that administering magnesium as a shot could improve symptoms of fatigue. However, no dosages are listed, and nothing is mentioned specifically regarding sleep (and it almost goes without saying that NoctuRest is an oral supplement). Also, taking between 2 mg and 12 mg of melatonin per day may have several sleep-related benefits, including improving sleep disorders in blind individuals, reducing the length of time it takes individuals to fall asleep and shortening the length of time it takes primary insomnia sufferers to fall asleep. For this last benefit, though, they emphasize melatonin only reduced the time by about 12 minutes. While research is ongoing, it’s currently unclear if the ingredient can provide the same benefits for those with secondary insomnia. Whether in NoctuRest or another formulation, these same sites tell us than 200-900 mg of valerian could be effective for addressing insomnia, although it may take continuous use for up to four weeks to achieve this benefit. Also, some research suggests it doesn’t work as fast as traditional sleeping pills. Finally, they indicate that passionflower (no specific dosage), 240 mg of daily lemon balm, or 220-1,110 mg of German (but not Roman) chamomile per day might help reduce anxiety. Could NoctuRest’s Ingredients Cause Side Effects? The manufacturer also tells us that NoctuRest’s all-natural formula causes no known side effects, although the sites above point out that the most common one is mild, temporary digestive upset (no dosages or other specifics provided). They emphasize that melatonin can sometimes have a major interaction with sedatives (central nervous system depressants). For these reasons alone, it’s always important to talk with your doctor before taking any new dietary supplement, NoctuRest or otherwise. How Much Does NoctuRest Cost & Where Can You Buy? However, we also found bottles on sale through Amazon for as little as $32.30 each, which could help you save a little money, in addition to the free shipping if you’re a Prime customer (otherwise, you’ll pay a flat $5.95 through the company). Direct NoctuRest orders come with a 60-day money back guarantee, less S&H, which you can request by reaching out to support at (949) 274-4594 or help@Rejuvica.com. What Are NoctuRest Customers Saying In Their Reviews? On Amazon, 350+ customer reviews had given NoctuRest a 3.6-star average rating, with compliments citing effective results (improved sleep quality, ability to sleep longer, etc.) and natural ingredients, while more than one complained about no results and less-than-stellar taste. The supplement is manufactured by Rejuvica, LLC, who are based out of Costa Mesa, CA and has been in business since 2015. They held an A- rating with the Better Business Bureau, based on two closed customer complaints, as of 2/7/18. Details were only available for one, which referenced difficulty stopping shipments. A representative responded with a resolution. 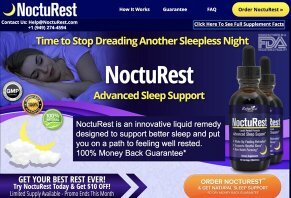 Are There Other Liquid Sleep Supplements Like NoctuRest? You might've already known this, but there are perhaps hundreds of different liquid sleep supplements competing with NoctuRest, whether in-store or online, priced anywhere between $5 and $55+. Many also include the same core ingredients and dosages (when available) as NoctuRest, such as melatonin, theanine, passionflower, lemon balm, chamomile, and hops. How in the world can you cut through all the clutter and make the most informed decision possible—before handing over your money? First, it bears repeating that you should start by talking with your doctor, who can recommend treatment options—whether prescription or over-the-counter—tailored to your specific diagnosis. Next, because dietary supplements are largely unregulated by the FDA, it’s important that you focus on buying from a reputable manufacturer. Be sure to ask: How long have they been in business? What are their customers saying? Do you encounter any common complaints? Are there claims supported by evidence? Finally, because dietary supplements can work differently for everyone, make sure that the company stands behind their products with at least a 30-day refund policy. Also, that they don’t charge excessive S&H fees, or steep restocking fees if you decide to process a refund. How does all of this line up for NoctuRest? NoctuRest seems to come from a reputable manufacturer with several years in business, along with mostly positive online customer feedback. It’s also supported by a 60-day refund policy if you’re dissatisfied, although you’ll lose your initial shipping, plus whatever it’ll cost to send back to the company. Furthermore, sites like WebMD and the Natural Medicines Database report that many of the supplement’s ingredients have sufficient clinical evidence to label them as ‘possibly effective’ for reducing insomnia, promoting sleep, and relieving anxiety to some degree. Will it work for you, though? According to Lisa Shives, a sleep specialist and spokesperson for the American Academy of Sleep Medicine, “While scientific research has not proven the effectiveness of many natural sleep aids,” some of her patients report effective results, so the only way to know for sure is by giving it a try. Just keep in mind that if the price is one of your top concerns, your doctor might be able to recommend formulas that contain many of NoctuRest's ingredients, but that are available locally to help you save S&H and get it in your hands faster. I started with the double dose as they recommended for severe or long time symptoms. It seemed to help me get to sleep although lots of other things do that. I was not able to sleep for more than a few hours and taking more drops did not help me get back to sleep. I used the whole bottle, about three weeks, and no additional improvement. I will keep looking. I will see if their money back guarantee is true. Write a Review for NoctuRest!